Do you know how to say thanks for the birthday wishes you receive from the people? If you are like me who always remain confused while responding to all the well-wishers on his birthday, then this article is for you. Mostly I have seen that people nowadays give birthday wishes through Facebook and other social media websites and apps. 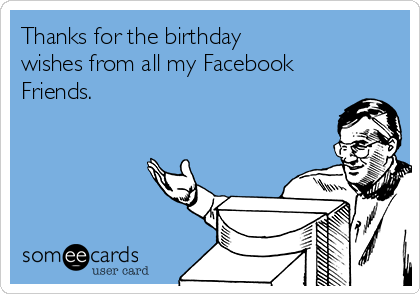 Even there are numerous people in my Facebook friend list who post on your wall with greetings and cake images. There are some people who post a single post on their Facebook wall saying "Thank you, everyone, for your wishes." Birthdays are really special because they come once in a year. People from our family and friends prepare to make our special day all the more special and joyful for us. You plan to give a big party to all the people and enjoy getting more and more wishes in their own unique styles. Innumerable people wish us on our special day through messages, WhatsApp, Facebook and other social media apps/sites which make our birthday really memorable. 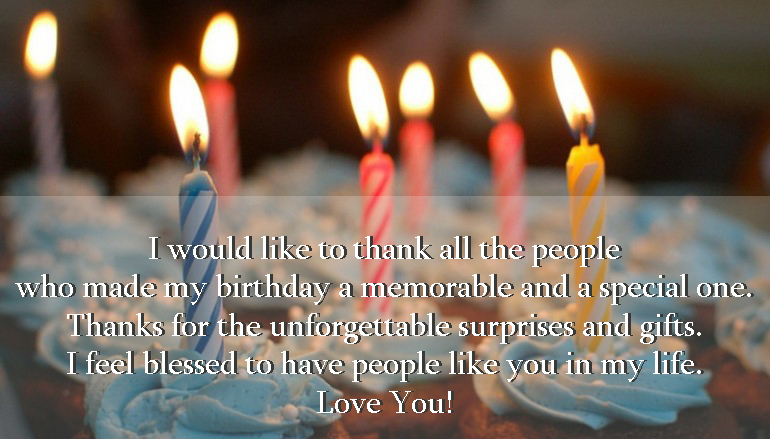 After receiving the wishes, it is your turn to say thanks for the birthday wishes but how to do it? We all know really well that we have moved into the busier life phase where people don’t have much time to say thanks for the birthday wishes one-by-one. And thus, we have created the special thank you messages and thank notes. Though there are multiple ways to say thank you and show appreciation, but according to me the best way to say thanks for the birthday wishes is to write a personalized thank you note. 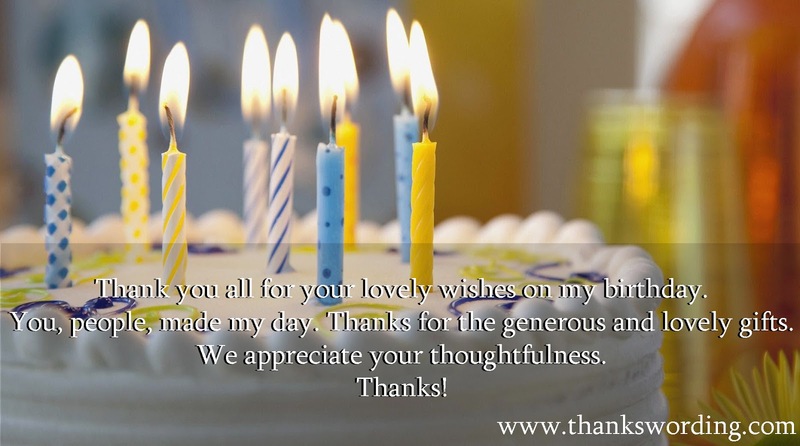 So, here I am sharing some of the best personalized thank you notes or messages which you use to say thanks for the birthday wishes you receive. Your wishes are keepsake which will be with forever. These wishes will always remind me all the beautiful memories. Thanks much! Birthday lasts just for one day, but your wishes are forever. Your wishes made me feel all the more special on my special day. Thank you so much! Your birthday wishes were just the perfect to make my special day all the more special. Actually, your wishes just blew me away. I can never replicate the feelings and warmth which you gave me through your wishes. Thanks! Your birthday wishes were just priceless to me. They are the true epitome of sweetness. Now I realize that how much loving and caring you are. We can buy gifts from the money we earn, but it is hard to earn friends like you. Thank you so much. Your wishes were special. These are the beautiful memories that no amount of money can buy. Your wishes made me believe the value of our friendship. Thanks! My birthday celebrations would have been incomplete without your wishes. Thanks for being my friend. Thank you for sending me beautiful birthday wishes. Birthday gifts get broken or lost after sometime, but your priceless birthday wishes will always remain close to my heart. Thank you so much! I would have felt lonely without your wishes on my birthday. Thanks for remembering! Accept my sincere thanks for the birthday wishes and surprise which you gave. I just loved the gift. Thank you so much! Your blessings touched me. Thank you for making my day all the more special with your warm presence. Thanks! We thank you for your kind presence on my birthday party. You gave us beautiful birthday wishes. Thank you once again for your loving presence and sincere blessings. Thank you all for your lovely wishes on my birthday. You, people, made my day. Thanks for the generous and lovely gifts. We appreciate your thoughtfulness. Thanks! Thank you guys for the lovely surprise and awesome gift. This was my best birthday and you people made it a special one. Thank You! Thank you, people, for making my special day a memorable one. I love you all. God bless. I would like to thank all the people who made my birthday a memorable and a special one. Thanks for the unforgettable surprises and gifts. I feel blessed to have people like you in my life. Love You! It was so much fun celebrating my birthday with you all. I am short of words to say thanks to you people. 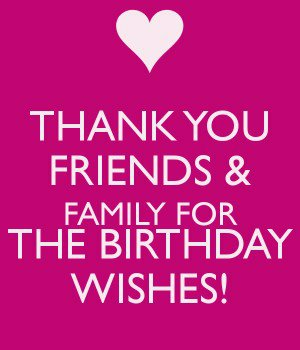 Thank you, everyone, for your wishes and blessings on my birthday. Believe me guys! You all made my day. I feel blessed to have you all. Thanks a lot! Thank you for your beautiful smiles, warm wishes and lovely gifts on my birthday. Thanks a ton for making my birthday an unforgettable day of my life. If people send you birthday wishes and make you feel special, then they too deserve to be appreciated. To show them your proper etiquettes, it is must to respond to their birthday wishes. You can use the wishes which I mentioned above either as a personal thank you or for a single thank you post. But these wishes are meaningful and personal, so use these for thank you notes. So, if you are really figuring out about how to say thanks for the birthday wishes, then you can use these personalized thank you messages mentioned above.